Standard flow. Available sizes include: 2.5, 3.5, 4.5, 5.5, 6.5, 7.5, 8.5, 9.5 and 10.5 in hg. For example 427125-45, 427125-35 etc. High flow 1 Series (big window valve) for alcohol. Available sizes include: 2.5, 3.5, 4.5, 5.5, 6.5, 8.5, 10.5 in hg. For example 427125-145, 427125-135 etc. Engine vacuum will hold the valve closed until vacuum drops below the cracking point, measured in inches of mercury (in hg) at which time, the valve will open and enrich the fuel mix. It is quite common to put very low numbers in multi carb systems. 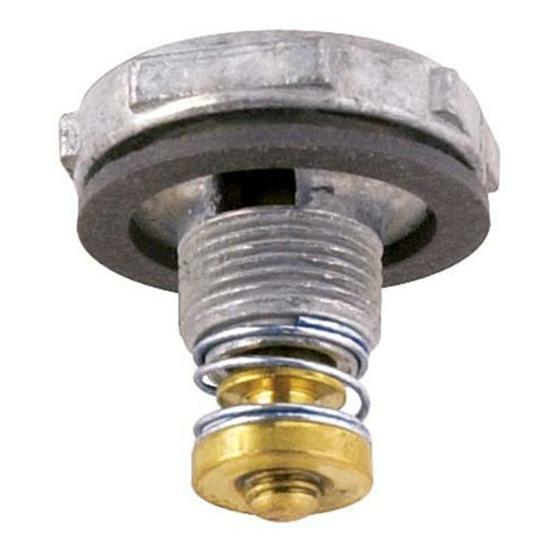 The reason is that if standard single carb valves are used, it will cause the engine to be overly rich. When you are at a part throttle cruise at 55 mph (say, with a 12 in hg of manifold vacuum) and you squeeze into the throttle to go up a hill or pass a car, the manifold vacuum drops (say, down to 7 in hg) and all three power valves open. Normally, this will make the engine soggy & rich, since it has three times the fuel enrichment that it needs. People will put in the lower power valves to delay the enrichment until nearly Wide Open Throttle. At WOT, the engine can normally consume the additional fuel without puffing black smoke or fouling plugs. The problem with putting -45 power valves in, is that it defeats the purpose of a power enrichment system. The enrichment system is designed to provide a slight increase in fuel flow as power requirements increase. If you install -45 power valves and they do not open until WOT, you lose the benefit of adding just a little bit of fuel when you squeeze the throttle a little. A better way is to put power valve plugs (or very low numbers) in the front and rear carbs and use a standard power valve in the center carb. The best way is to put restrictors (PVCR or power valve channel restriction, which are small lengths of stainless steel piano wire) in all three carbs, which limits the amount of fuel that is added, not when it is added.